we recently finished testing the mouse trap powered gliders. HUGE success. students had many design elements incorporated into their gliders, ranging from tiny planes to maximize acceleration due to newton's second law, to airfoils on wings to maximize lift, center of mass at 1/4 from front to maximize forward glide and stability, dihedral wings to prevent rolling, and high aspect level to reduce drag and maximize lift for low energy flight. This was easily our most research intensive project yet. those students that understand basic areodynamics and how they applied to low energy flight (ie gliding) and the basic principles of physics (ie newton's laws) were easily the most successful. during practice launches many students were reaching 7 to 8 meters of flight consistently. though during the final testing only 1 student reached the seven meter make and a few teams reached 6 meters. 3 types of launch systems were developed and used. most used a basic mouse trap and adjusted how far back they pulled it to launch the plane at the desired angle. other groups propped the plane up at a level that changed at which point the bar connected to the plane (either by attaching a stand to the front of the plane or by having the plane hang over the edge of a ramp). And a few groups added an extra arm and a string to the mouse trap turning the initial upward motion of the bar into continuous sideways motion as it pulled the string forward. Each launch method that was employed worked for the planes designed for it but if the planes switched launch methods then they no longer functioned well. this shows that the iterative process does design the best planes for the paths they have chosen. I am very proud by the work produced and the fashion it was produced in of most of the students during this challenge. The last project saw Dragonneo raise their notebook point by 20% because of sharing his helpful research and observations with the class. Also Datschmidt raised his notebook check grade by 10% for his contributions. Similar bonuses or even more bonuses if more people deserve them will be handed out for mousetrap planes for use of the reddit community. Also, as i am entering grades there is a problem that is arising over and over again. Students do not have their bridge notebooks in class for me to check. I have now entered those grades as missing. this has hurt many grades. I have also entered grades as missing for rough drafts of papers. they were due last Friday. i have received three of them. if i don't have them by Wednesday then i cannot reasonably be expected to review them and then get them back to be useful in iterating for the final draft. I have still deciding if i will change the gradebook to have these grades be a part of the 1st quarter instead of the second quarter since most of the work was first quarter. I suppose i will make that decision after i have seen all the papers and the numbers, so i know how it would effect those grades. Students have begun our first challenge that incorporates research. 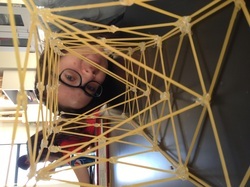 We are building scale bridges out of spaghetti that we will then triple in size to make out of a soft wood (pine or balsa). Most students started out with a flat plank style bridge. since then and a little bit of looking at pictures most students have started incorporating triangles into their designs, which is a really smart move. I hope you have the research to explain why that's such a smart move in your papers. I'm really excited about all the different designs I'm seeing the kids come up with. We need to increase the pace that we are crafting with so that we can test them all and have many iterations. it is concerning that 2 weeks in and most groups are still on their second or at best third iteration. speed of crafting instead of making sure each iteration is completely perfect is a challenge for the class. We have also started a reddit community at http://www.reddit.com/r/warreninnovation/ where students are sharing design models and useful research sites. i hope to see more upvoting and comments soon but i have noticed a small but steady increase in the number of students using the site as a resource. and now for the glimpse of your next challenge. just to tantalize a little bit. it will involve rat traps (like mouse traps but bigger) and i will be removing material restrictions! Biggest news is that i have added a second deck of cards to the material list. I have done this because having more cards does not realistically make a meter goal any easier if working with standard card house building techniques but makes getting well over a meter possible with a little ingenuity and thus hopefully improving competition. I have also added an additional potential idea to the student work boxes this afternoon: a pair of scissors. I won't mention them to the students tomorrow but they are there to be used as a spring board for other ways of manipulating the materials. students were put in groups of four and thrown into the challenge. 2 groups failed to have a standing structure and the others were at 10" and 16". then we watched the video (seen at the link above). groups were shuffled and the challenge was done a second time. After that students did a slightly better job about focusing on the marshmallow from the beginning. More students also started including triangles. I wanted to see more students working directly with the marshmallow from the very beginning and i had to remind them to focus on the marshmallow make sure your structure is solving the problem of the marshmallow weight. HOWEVER, despite needing those extra reminders (or perhaps because of them) there was a general increase in structure performance. with groups coming in anywhere between 14" and 18". there were far fewer CRISIS moments at the end because the marshmallows were all attached at least 5 minutes after the start and worked with after that. hopefully this has helped students remember to solve the largest problem first, work from there, to build many iterations of ideas, and to focus on the goal.